I am hopelessly old school in some ways — I continue to resist the trend towards electronic publishing in wine, for example. Although I read the Financial Times and Wall Street Journal on small screen devices, I can’t resist the look and feel of print wine magazines like Wine Spectator and Decanter. So I am interested when old print publications take new directions (apart from the obvious and perhaps inevitable road to an on-line only existence) and when new print magazines enter the marketplace. Here are a couple of interesting recent developments. Wine Enthusiast magazine recently announced a major redesign and the change is more than skin deep. Yes, the physical design of the magazine has changed, but what’s new is something that is also really old. Wine Enthusiast is called by that name because it isn’t just about wine, it is about the world of the enthusiast, the reader, who experiences wine in many ways. 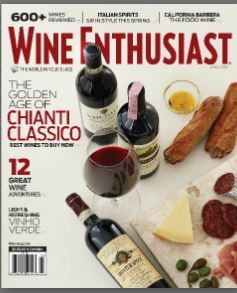 The newly redesigned Wine Enthusiast Magazine is back this month with even more lifestyle coverage! The April issue covers a variety of epicurean adventures from highlighting the golden age of classic chianti to a breakdown of trending party savers to the “Recipe of the Month: Banh Mi” and even a piece on the salty side of cocktails. This issue further showcases the publication’s dedication to its FRESH and lifestyle focused revamp. The new Wine Enthusiast (winemag.com) now delivers the best of epicurean culture through engaging and compelling content that is entertaining and “of the moment.” The new, fresh look better reflects the audience of contemporary wine drinkers while continuing to provide insights readers won’t find anywhere else. The Buying Guide with ratings and tasting notes (for wine, spirits and beer) is still there, of course, but there is even more content than before relating to destination travel and food, chefs and recipes. That’s no surprise, I suppose, since so much of our lives now bears the mark of trends and celebrities from Food TV and The Travel Channel and it makes sense that wine magazines would be part of this pattern. Wine marketers have learned to play the lifestyle card and the Australians are betting heavily on it for their Restaurant Australia wine/food/tourism promotion. Wine magazines are on the band wagon with the rest of the media. Although wine is my serious focus, I must say that I found the lifestyle aspects of the new Wine Enthusiast engaging and entertaining. Don’t judge me too harshly for this statement. It is easy to criticize the lifestyle marketing trend, but I think that magazines probably need to move this direction to stay relevant. Even Decanter, my favorite monthly wine publication, has its share of lifestyle articles and is in fact part of its publisher’s portfolio of lifestyle magazines in various fields. Wine Enthusiast has not blazed a completely new trail, since this is where wine publishing has been going for some time, but rather has transformed itself by more completely committing itself to the journey. 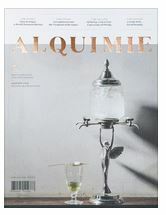 Alquimie is a quarterly magazine from Australia. Edition Two arrived at my doorstep a couple of weeks ago and it has taken me a little while to really understand and appreciate it. At first glance Alquimie appears to be a sort of luxury lifestyle magazine full of beautiful photos and illustrations on rich paper stock (but minus the luxury good ads that you might expect to see). It reminds me a bit of Slow, the magazine of the Slow Food Movement or maybe a wine version of Granta. Both of these publications have a distinctive style and feel and pride themselves on taking their readers in serious new directions. Alquimie (think alchemy?) is so beautiful and distinctive that at first I just wanted just to page through it and to enjoy the sensations that the images evoke. It took a week or so before I finally sat down and actually started reading the articles. That’s when I really became a fan. Alquimie says that its goal is “Breathing New Life into Drinks” and I think it succeeds by breathing new energy into drinks publishing. The magazine is divided into four parts, The Story, The Study, The Palate and The Excess and each contained something of interest in the issue I was sent. Since I’ve visited Australia, South Africa and Portugal in recent months I was naturally intrigued by The Study section, which included an excellent profile of South African Chenin Blanc, a report on the work of viticultural scientists at the University of Melbourne who are developing the Vineyard of the Future (look for more dogs and drones), and an introduction to some of the hundreds of indigenous Portuguese grape varieties. The tasting notes in The Palate part of the magazine are real works of art and were used artfully in several articles, including one that sought wines to pair with a four-kilogram Wagyu rib eye steak and another that compared a 1990 Madeira wine with another from 1890. We also learn about an ultra-natural Tasmanian water so precious that it once sold in Europe for 22 euro per 750 ml bottle. The global financial crisis put and end to that market, but the water is still there and the passionate people behind continue to work to bring it to market. Is this a lifestyle magazine? It certainly looks it with its high design, rich materials and hefty cover price (AUD 18 per issue). But it is different and not just because there are no advertisements. It seems to me that it takes the lifestyle intent to engage with consumers at a deeper level than just products and pushes it much deeper and maybe in a some new directions. A really impressive achievement. I wish them much success! Mike – I share your opinion of Alquimie and will be talking to its editor on my Heard it Through the Grapevine radio program later this year. While I love 80% of the content of the Spectator, I’ve often thought they fall guilty of being esoteric for the sake of being esoteric. I like that the Wine Enthusiast is taking this new track, as it enforces the time/place/company experience that the majority of wine drinkers should revel in. So often dinner parties and tastings become duels to see who can supply or name-drop the most-prestigious and most-elite wines, rather than just enjoying it for the wonderful treat that it is. Good insights and I look forward to reading Wine Enthusiast 2.0. Off-subject, it is time to brace Twitter, Mike! Your name is everywhere there, but without a handle! I’d love to see posts from my favorite economics professor between those of Kim Kardashian and Jose Canseco! Mike, thank you for the shout-out. I’m very proud of the way Wine Enthusiast is re-inventing itself, embracing the needs and interests of young wine and spirits consumers, without abandoning the veterans. In fact the new emphasis on ‘Lifestyle’ has allowed me in recent issues to write about Walla Walla as a Top 10 Travel Destination (which helps all the tourism businesses in the region), and to do a short feature on designer coffee, which also included some boutique brands headquartered here in the Pacific NW. Upcoming is a feature on winemakers who have previously been professional mountaineers. All good stuff, fun to write, and it helps expand the horizons of those who love wine.